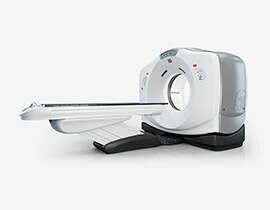 The unique needs of radiation oncology make it important to have image data across the entire bore of the CT simulator. Patients are often positioned off-center to accommodate positioning accessories and dose calculations require data from the entire physical anatomy. Until now, the architecture of the CT tube and detector had limited simulation technology, creating a compromise between efficiency and precision. MaxFOV provides edge-to-edge image acquisition with virtually no blind spots. Accuracy in the skin line and density detection facilitate accurate planning for any size patient. 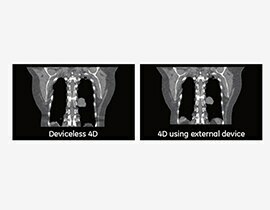 MaxFOV allows essentially complete imaging across the entire bore, allowing the patient to be adjusted off-center without jeopardizing image quality. Use of various positioning accessories. 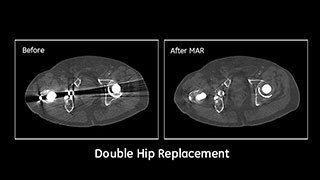 MaxFOV delivers precise imaging even when using flat table tops and immobilization devices. The scan field-of-view is always smaller than the gantry bore, due to the architecture of the CT tube and detector. The smaller field-of-view may limit the information needed for accurate simulation and planning. Traditional reconstruction algorithms only use the attenuation data that is completely common to each detector view which is also known as the scan FOV. The data that is in the common surface to each view is only a fraction of the data collected. The rest of the data can be leveraged to image the entire bore with an advanced iterative algorithm. MaxFOV technology is designed to leverage all the acquired data to enable viewable imaging to the edge of the bore. MaxFOV detects both the patient and non-patient information in sinogram space. The non-patient objects are managed in the sinogram space to minimize interference artifacts in the MaxFOV imaging space.